Yesterday I tried out a remarkable transponder/DME/ADS-b antenna I made. It is called an annular slot antenna. Very easy to build out of brass sheet stock. I never heard of this type of antenna. 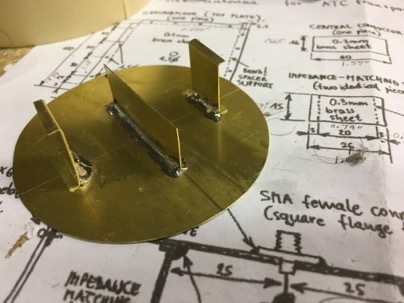 Apparently they are used extensively and most military aircraft use this type of antenna because they are no drag and totally flush on the surface. 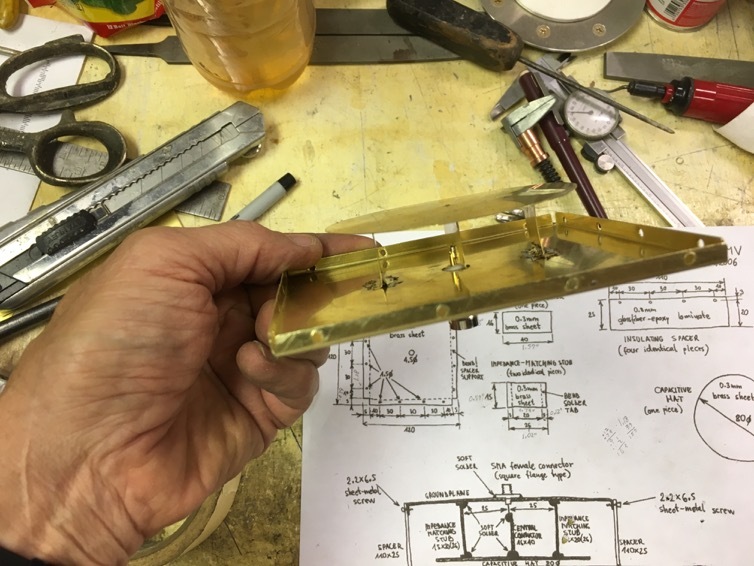 Jack Wilhelmson told me about this antenna (he made one, but not tested) and gave me the drawings/materials, so I thought I would try making one for the plane. Here is the fabrication drawing. Units are in MM, and be aware of the funny looking (European) “1” they look like a upside down V. If you look at the date of the drawing, you’ll see what I mean. It was easy to solder it all together, and I had an extra BNC panel connector for the cable. It took about an hour to fabricate. It is so simple to make I wondered if it would work at all given that it does not have a large ground plane, and is very weird looking. To test the antenna, I temporarily ran a jumper cable from my existing transponder antenna location to the new antenna and went flying. At 3000 ft, I flew outbound from KCHS. At 25 miles, the transponder reply to ATC became intermittent. I was told by ATC that is about normal for most airplanes at that altitude which was very good initial test result in my mind. As soon as I banked around to return to the airport they immediately picked me back up again. 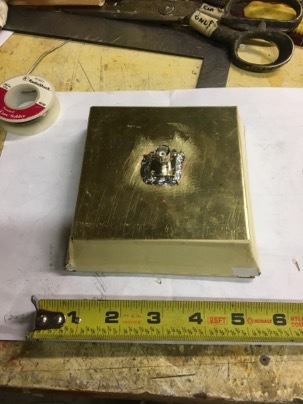 So possibly, the signal was being shielded by the engine and the extensive ground planes installed in the aircraft. I plan to leave the antenna connected in the plane for a while so I can test it on a real cross country flight to see if it performs as well as my existing external antenna. If it does, then I will definitely be using this design for my transponder/ads-b antennas in my future airplane. I would use it on my plane, but the entire bottom of the fuselage is painted with ground RF paint so I have to stick with my existing antennas. This design will save a bunch of money, and I don’t have to worry about installing large ground planes for external antennas. Low drag transponder antennas are $80-$160 for a shark fin type. This one is no drag. One could hollow out the fuselage foam in the put a layer of glass to seal the foam and flush mount them on the interior of the plane and you would have no antenna exposer at all on the exterior. 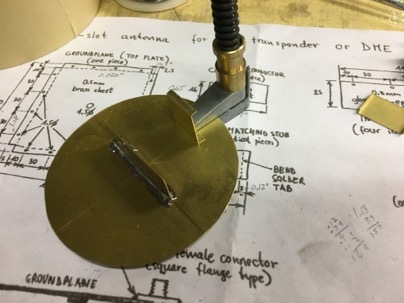 Best of all you can build 2 of these antennas (for transponder and ADS-B) for about $25 with brass you can buy on amazon or a local hardware store. I am amazed I never heard of the design. 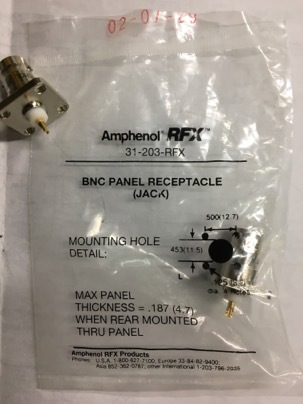 A BNC panel receptacle number 31-203-RFX about $4.00 Obtained at a local electronics store. 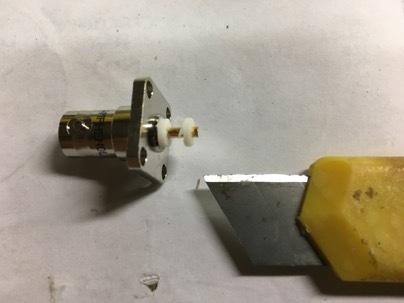 You could screw or rivet to hold the connector to the ground plane, I just soldered it. 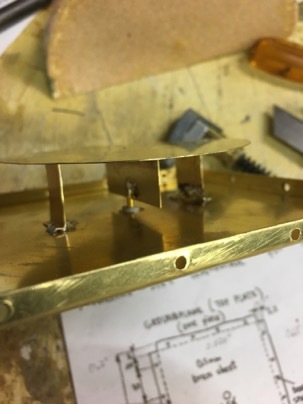 After soldering on the center rib, you attach the side supports. A cleco makes it easier to hold the rib in place. Attaching the electrode is easier if you pre-wet the areas with solder, then hold the pieces together to connect the parts. 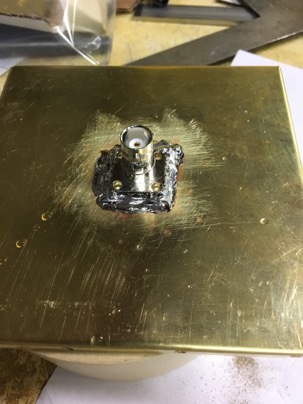 After the center electrode is done, solder the side supports to the ground plane. Done! I used a piece of card board to make a small enclosure case to protect the element and for testing.